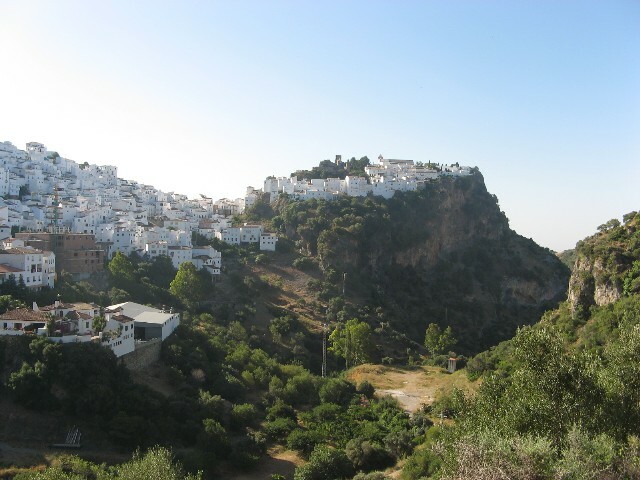 Casares is beautiful, everything you imagine when you dream about living in a small Spanish village. While only 20 km from Estepona, on the Mediterranean coast, it is worlds away through twisty roads and mountain forests. Pine trees and cacti grow side by side as we progressed up the canyons. My enthusiasm mounted as we turned along. Every crest brought more anticipation for the town itself to appear. We researched a lot of villages before our move, and Casares was at the top of our lists of places to consider living. From the little we could find, it supposedly still had the feel of a Spanish village with access to the coast and schools within a 30 minute drive. I realized though that it wasn’t a drive I would want to do twice a day commuting to school. Perhaps we would have to home school while waiting on our visas? I was excited enough with what I was seeing that I was willing to make all kinds of trade-offs! Suddenly we reached the town, the remains of the castle on a crag opposite us, and I realized the town was built in the hollow in between the two tops. The streets dizzyingly narrow plunged down. We piled out of the car, eager to explore Spain after our lunch in Marbella, also known as “little England,” of eggs on toast and beers. Grace, proving to be most like the Spanish women, chose to brave the streets in her fancy high heel espadrilles. Scott and Emma whipped out their Keens; me somewhere in-between with my cushier than normal, flat sandals. Our descent into the village was breathtakingly beautiful. The narrow street switch backed down, with doorsteps at each turn. Pots of geraniums flanked the doors, ivy and bougainvillea flowing down the walls. An old man with a cane approached from the bottom. We paused to let him pass, each offering a tentative “Hola, buenos dias.” He responded back, “Buenos dias,” though he pronounceed it as if he had a mouth full of marbles. At the bottom of the street, the town square opened up to us. There was a fountain in the middle, an old woman wearing a blue apron filling her mop pail and then shuffling on to her front door to clean her part of the street. There were several bars and restaurants around the square with tables and umbrellas out. It was hot enough that the old men found the shade along the benches on one side of the square. Of course, it’s siesta time and the shops were all closed and most people in their homes, escaping the heat of the day. We have yet to time our arrival and departures from these towns correctly. We followed the signs to the castle, figuring the ruins would be open since everything else was not. So back up we went, winding again through Casares’ streets. There was not much left to the fortress at the top other than some beautiful vantage points to view the village and sea in the far off distance. Thankfully, there was a “Castillo Bar” off to the side, full of tables set in the shade of trees. Here is where the two tables of tourists were, having beer or wine and resting their tired legs. We happily joined them! We discovered later, after more wandering, that was Casares. Not much to it besides its spectacular views of the countryside. We decided to stay for the night and enjoyed a nice meal at the one restaurant with a TV, most of the town’s men there to watch the futbol game between Spain and Russia. Spain won 3-0 so we enjoyed cheering for Espana along with the boisterous crowd. The Spanish women apparently don’t watch soccer or either don’t watch it with their husbands at the bar. There were a few out in the square, pushing strollers or enjoying ice creams, but most were not to be seen. Casares’ only hotel, the Hotel Casares, was a nice rural hotel. Very clean, the smell of bleach throughout the hallways, and simple but a pleasant experience. Over breakfast of café con leche and toast, we discussed that Casares might be a bit too small for us to live day to day. We decided to head for the next beautiful town on our list, Gaucin, up the mountain another 15 minutes. It all sounds so charming and idyllic, but probably boring as a “permanent” residence. Maybe it is the US equivalent of downtown Eudora, without the ruins and hotel! The right place is there somewhere, you just haven’t found it yet. I printed all of your entries to date and read them aloud to Mom while I was visiting her the past 4 days. She spends her time listening to audio books on tape, but this was much more personal and interesting. She enjoyed it! I think about all of you many times a day and send lots of hugs and kisses to all of you! Congratulations for discovering my (current) home town. One little typo – Casares is about 20km from Estepona, not 2. Nice photos. The lady with the bucket is Josefa, one of our neighbours. She’s also a good friend, always giving us advice about looking after our pot plants. To thank her, my wife gave her some packet seeds. She was almost overwhelmed with this litle gift, and everything she’s planted has sprouted. The girl (yours?) 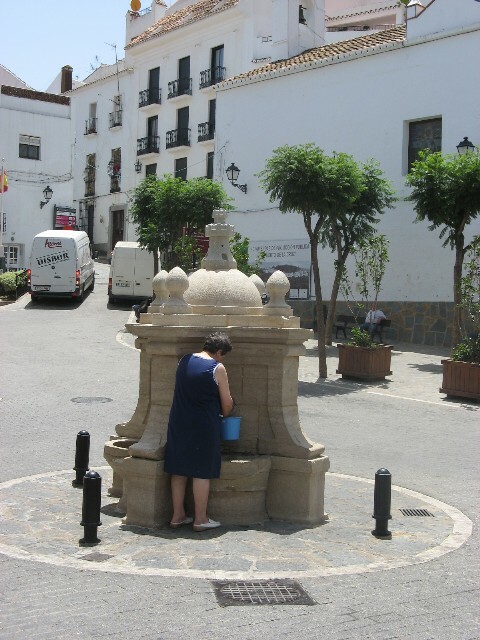 is pictured outside Josefa’s house which gives you an idea of how far she and her husband Vicente have to walk into town – there are forty-two steps between their house and the nearest street. We live just a couple of doors down from her. The day after you visited, the town was invaded by an Australian film crew (making a commercial we believe). They spent the whole day filming in the town and brought whole sets with them, including full size olive trees. I found out from the film crew that they were shooting on 35mm film, surprisingly expensive and quaint. Living in a small town like Casares requires that you mix with the locals. It’s the only way to find out what’s going on. That way you also end up (eventually) being invited to parties etc. There is more to the town than you think (though unfortunately no cinema) it has its own sports centre and community hall, even its own radio station. There are also places to visit out of town, such as the Roman baths of La Hedionda. As with any town in the country, the events are in tune with the seasons. There are two ferias each year and numerous concerts etc. – this weekend has just seen a presentation of theatrical plays by children from all over Andalucía. It took two days to show them all. Good luck in your search for your ideal place. Thanks so much for your post! I love knowing Josefa’s name and more details about Casares! I look forward to digging into your blog too about your time here in Spain. 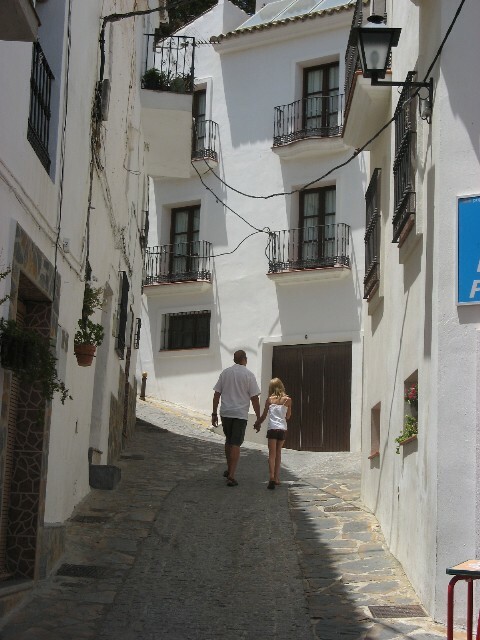 I visited Casares whilst on holiday in Cancelada near Estepona in early August. I would love to know what the structure is in the valley to the south-west (?) of the town. We explored it briefly but can’t make any sense of why it was built or when, nor do any guide books shed any light. I’m refering to the oval shaped building built on a mound with all the little huts around the edge and the red brick walls in the centre, it looks almost like a huge sun dial. We wondered if it was some sort of cemetary. Any ideas please Nigel or others? I am fairly certain you are referring to the new cemetary being built for the village. I too could not figure out what it was and asked one of our neighbors in Casares for an explanation. He said it’s the new cemetary, as the one up near the church and castle is full. I am not sure how far from completion it is. Also, once it’s finished, they will paint it entirely white. I have learned that the dead in Spain are buried in vaults above ground. I was also told that the vault is leased in ten-year periods so the family must keep up the payments or the dead are kicked out! I am not sure if this is a common practice or perhaps just in larger cities where there is less room. Hope you enjoyed Casares. We have just left there from our two weeks of living and exploring! I like to go to Casares when ever staying in the area – its a traditional Spanish white village – almost untouched by tourism so far. And just 15 minutes from the lovely beaches of Costa del Sol. I live in casares! i fel in love with it 10 years ago. i have got a house there since 2006. the old cementery “flower cementery” it’s full so a few years ago they started to build a new one but it is not finished, and i don’t remenber why. they stoped the work 13 years ago. i’m not there now but in may i’ll go there so if you would like to ask something about the village i’ll ask the people there.